El Dorado Dreaming, the surprise Group 1 winner of The Championships, is back in work with trainer Ben Smith and is being set on what he admits is an ambitious spring campaign. The rising three-year-old is just over a week into a slow build up to a planned mid-September return in the Group 2 Tea Rose Stakes (1400m). Smith then has four straight Group 1 races in mind – the Flight Stakes, Thousand Guineas, possibly the Cox Plate, and culminating with the VRC Oaks. “She’s come back a much more mature horse,’’ Smith said. The filly’s win in the Group 1 Sires’ Produce Stakes was easily the upset of the carnival as she started with an SP of $81, paid $105.80 on the TAB and $151 with Fixed Odds - a week after being beaten in a Newcastle maiden. She backed that up with a gallant third in the Champagne Stakes over a mile, a run that confirmed to Smith he had a serious classic filly for the coming season. “You’re 100/1 and winning a Group 1 as a maiden so the jury was out whether it was a fluke or not,’’ he said. “But her run in the Champagne justified what we thought of her and that she is top class. El Dorado Dreaming put on 40kg in her break and will spend the next three weeks doing conditioning work before her program is stepped up. By that time Smith’s Everest runner In Her Time will be back in his stable. 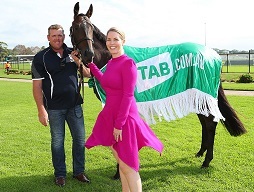 In Her Time’s Brisbane campaign was aborted after a below par effort in the Doomben 10,000 on May 12 but Smith said she only went to the paddock at the start of June. Trainer Ben Smith and TAB's Jaimee Rogers with Everest runner In Her Time. “I’ll go and have a look at her at the end of this week. She’s only got another three weeks to go and she’ll be back in,’’ he said. “I think it was a smart move (to spell her). We couldn’t find anything wrong with her but she may have just come to the end of the prep. In Her Time will have an identical preparation to last spring as she heads to the $13 million The Everest (1200m) at Royal Randwick on October 13. She’ll resume in the Group 2 Premiere Stakes (1200m) two weeks earlier then take TAB’s slot in Australia’s richest race. In Her Time, of course, then won the Sydney Stakes over the same course on Everest Day. She’s an $11 chance behind outright favourite Trapeze Artist ($4.50). “It’s the path we followed last year, it worked last year, so we’ll head back that way,’’ he said.